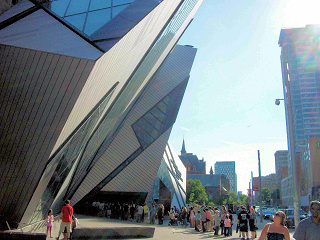 The Royal Ontario Museum (ROM) is the largest museum in Canada for world culture and natural history, and among the largest museums in North America. Free admission on Wednesday evenings from 6:00 p.m. to 8:30 p.m. (Permanent Collection only). With its main entrance facing Bloor Street in Downtown Toronto, the Royal Ontario Museum is situated north of Queen's Park and east of Philosopher's Walk in the University of Toronto. Founded in 1912, the museum has maintained close relations with the university throughout its history, often sharing expertise and resources. The museum remained under direct control and management of the University of Toronto until 1968, when it became an independent institution. Containing more than six million items and forty galleries, the museum has notable collections of dinosaurs, Near Eastern and African art, East Asian art, European history, and Canadian history. It also houses the world's largest collection of fossils from the Burgess Shale with more than 150,000 specimens. Tickets: See: Ticket Types & Prices. Free Wednesday Nights: Enjoy free admission to the ROM every Wednesday evening from 6:00 p.m. to 8:30 p.m. (Permanent Collection only. Excludes surcharged exhibitions). Hours of Operation: Open Tuesday through Sunday (closed Monday); closed December 25 (Christmas Day). Tuesday: 10:00 a.m.  5:30 p.m.
Wednesday: 10:00 a.m.  8:30 p.m.
Thursday and Friday: 10:00 a.m.  5:30 p.m.
Saturday and Sunday: 10:00 a.m.  5:30 p.m.
Yonge-University Subway Line: Exit at the Museum station and walk north along Queen's Park (there is no entrance to the museum on Queen's Park). When you reach Bloor St West, turn left and you'll see the entrance in front. Bloor-Danforth Subway Line: Exit at St. George station and walk south (south is towards the CN Tower) to Bloor St West. Cross the road to the south side, turn left and walk east along Bloor St West for 200m. You'll see the museum entrance on the south side of Bloor St West. Village Idiot Pub: 126 McCaul St, at the north-west corner of Dundas St W and McCaul St.